It would be perfect for couples who love the beach to get married in the beach area. With breathtaking views and nice natural backdrop, everything will be surely mesmerizing. Just like any wedding, planning to have a beach wedding should be done right. This includes choosing the right beach location, deciding which decors to incorporate into the theme and selecting the gown for the bride, and all else in between. In this article, let us discuss things you don’t know about planning a beach wedding. 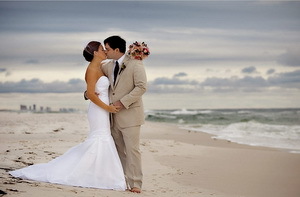 In choosing a beach to host the wedding ceremony, you should factor in the tourist season, the weather and the crowd. Be aware that there are beaches that allow booking for a private area which gives you more privacy and lets you off the hook from prying eyes. Consider also the time of day when the wedding will be held. It is recommended that reservation for the location is made at least six months earlier to a year before the big day. Especially if you are inviting hundreds of guests to the wedding, make sure that you get a proper permit from the beach management or the local community. Learn in advance on how to get the documentation and required paperwork to conduct a wedding in the beach. This will keep you from troubles and also give you permission to set up canopies, chairs and aisle runners. If your idea of the best wedding gown is the white, Cinderella-type gown that flows to your ankles, you probably have to skip it when your feet are on sand. Wearing a simple dress that’s made of lightweight material like chiffon or Charmeuse will allow you to move easier with grace. This will save you the hassle of picking up debris and getting stuck on the beach while still making you look beautiful and elegant. Also think twice about a long veil. You will not be walking down a concrete aisle, so instead of the usual high heels, it is advisable for the bride and the entourage to wear a decent pair of sandals. Comfort is a big thing as you don’t want yourself and the guests to be sinking their shoes into the sand and shouting out for help for being stuck. With sandals, you still can have the option for bridal designs like flowers, embroidery, sequins, pearls, Swarovski crystals and the like. The bride’s hairstyle will matter a lot on the overall appearance and this will form a large part in the lasting impression on everyone attending the beach wedding. Hence, it will be best to choose an up-do rather than wearing the hair down since it is more than expected that the beach area is windy. To give out a polished look, keeping a bun or tying the hair with glamorous hair accessories should do the trick. Guests should be offered with light refreshments as they may choose to enjoy and swim in the water after the ceremony. Having a full stomach won’t do them good, but make them feel heavy for beach activities. To keep your guests refreshed, getting service from a good catering in Manila will do. Treat the guests with nice drinks such as iced tea, signature cocktails or even mosquitoes while they are under the sun. The weather is unpredictable, even when the weather report says it won’t be raining on your wedding day. There may be drizzles that would unfortunately form into a heavy rain in midday. The event will not be completely ruined if you have a solid backup plan. Have a tent ready or a request for a space indoors near the beachfront so you can keep everyone attending the wedding warm and safe. A wedding does not have to be always held inside the four corners of a room. Modern-day wedding ceremonies and celebrations take place in beautiful beaches highlighted with comfy casual nature. Utilizing the beach, hiring wedding coordinators, wedding service professionaland catering services will help make your dream wedding come true. YyannaReema Marquez is a writer by passion based in Manila, Philippines. She is a part-time wedding planner, event coordinator and a student of Interior Design. Connect with her on Twitter.